“As an optimist, when I look at this data, it looks very encouraging to me. First, it is definitely viable to live to 120. It has already been done! Like the four-minute mile, someone has already shown the way. While I make this informal and what seems like a rather obvious deduction from the data, some folks disagree. James F. Fries and Lawrence M. Crapo in their book on Vitality and Aging make a compelling argument: while life expectancy has been increasing over the last many decades life-span has been fixed (for all practical purposes – increasing only by 0.1 year per century). 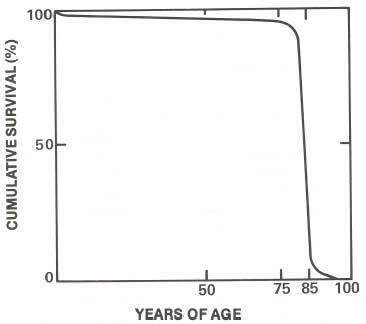 So, intuitively, the chart below may be how one would be tempted to guess the shape of life expectancy curves. However, they argue, that it is the chart below that corresponds to the reality. Thus according to their conclusion, while on an average humans are living longer and longer, we are still stuck at dying by the age of 100. Presenting the data from another perspective in the chart below, as we graph number of deaths against age of death, we observe a normal or Gaussian distribution around certain age at which number of deaths peak. 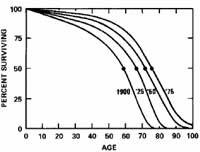 As the life expectancy keeps increasing the curve would look like the IDEAL curve below. And, as that happens, graph of percent survial rate against age will become “rectanguar” as shown below. 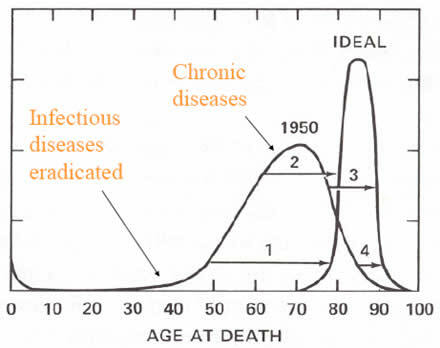 This implies that as we conquer chronic diseases, we will live a healthy long life after which we will succumb very quickly to the forces of nature, within the bounds of a very few years. And, that will define an ideal “natural” death. As we hit certain time limit, all of the cells in the body may burst together like soap bubbles. Fries and Crapo wrote their book in 1981. So I thought, with all the new research in the last 30+ years, maybe they have changed their mind. In a more recent review article in the Journal of Aging Research, Compression of Morbidity 1980–2011: A Focused Review of Paradigms and Progress, James F. Fries, Bonnie Bruce, and Eliza Chakravarty reassert the same conclusion and buttress it with more recent studies. I really like most everything else they assert, derive or conclude in that book- which I would like to talk about in a different post. However, I am personally not sold on this idea of fixed life-span. It makes me quite uncomfortable. Yeah, you guessed it. After all, my goal is to purposely live to 120! Have you seen any data, studies or analysis that contradicts this theory about fixed life-span? Post #3 – Is it even possible to live to 120? As I started wondering about these, I thought maybe I would start from the bottom of the list. Those questions certainly look easier. 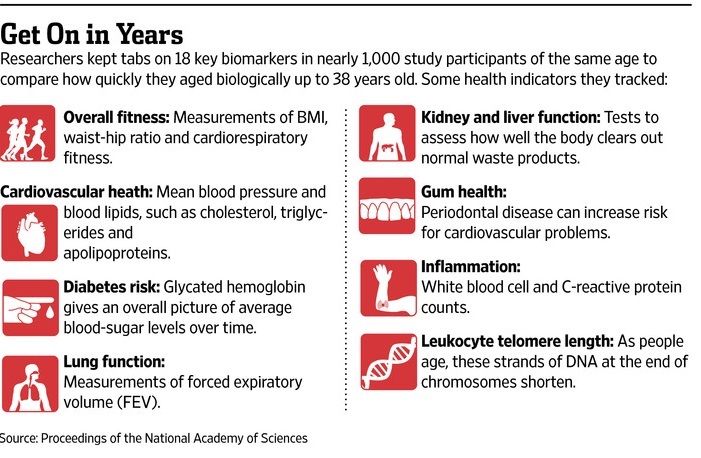 So, what is the recent record of longevity for humans? Wikipedia has some real good pages summarizing this information, for example, you can start with Oldest People and Super Centenarian. 1500 supercentenarians (those over 110) have been documented in history. There are 30 verified over 115 year olds. The oldest ever lived was Jeanne Calment from France who died on 4 August 1997 at the age of 122 years, 164 days. Sarah Knauss from the United States came closest to 120; she died on 30 December 1999 at the age of 119 years and 97 days. Two died at 117 years, and five at 116 years. The oldest currently living is Misao Okawa in Japan at the age of 116 years and 11 days. She is the 10th oldest so far. As an optimist, when I look at this data, it looks very encouraging to me. First, it is definitely viable to live to 120. It has already been done! Like the four-minute mile, someone has already shown the way. Second, an increasing number of people are approaching that age with an increasing rate. So, at this rate, by the time my time arrives, dying at 120 will be as routine as dying at 100 today! It might not be very common, but it might not be that rare. What do you think? How do you see these statistics? Post #2 – So, how do we die? So, how do people die? of life? – which can be an interesting trip down the rabbit hole. Let us ponder on how do people die? First, the simple answer: I just look up the World Health Organization (WHO) statistics or US Department of Health and Human Services (HHS) data and listed there are the leading causes of death. Of course, the causes vary by demographics. First, what are “All other causes”? That category is large enough to be the third largest cause of death. Some of these causes show up when we look at the top mortality causes for low income nations: HIV/AIDS, malaria, diarrhea, tuberculosis, all causes of infant mortality, malnutrition, cholera, meningitis, sexually transmitted infection, etc. I still have not found a good source of raw data for the US, so I can comb through all causes. After all, it would be useful to know all reasons, when shooting for longevity. Do you have a good source of such data? Second, what does it mean to die of “old age” or of “natural causes”? Does someone have another answer to this question?